We hope you are out and about enjoying the weather and the beautiful Dorset coastline, a dose of sunshine is certainly good for the body, mind and soul without a doubt!! This newsletter will cover July and August as the summer will be a quieter time for us regarding workshops as everyone will be holidaying or enjoying the outdoors. We still have all our regular monthly classes though. 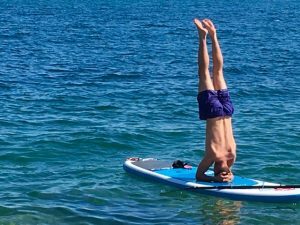 Maybe the summer will be a good time for some paddleboard yoga with Jez on Kingston Maurward Lake, or be a bit more adventurous like my son and try a headstand on the sea! Do keep an eye on the calendar to make sure your regular class is on in case your teacher is away! We are running our usual Wednesday morning Summer Yoga Classes starting on the 25th July on a Wednesday morning (10:00 – 11.30am for 6 weeks). This has been a tradition in Dorchester for many years when most teachers stopped for the summer, so that students could keep their practice going. It will be taught by a different British Wheel teacher each week. Although yoga is much more accessible through the summer now, it is still enjoyed and a lovely social occasion for those who have been doing it for many years. Anyone is welcome to drop in. Magic Drum have a wealth of experience in providing drumming workshops and activities for all sorts of groups – some people may remember their huge drum circles at Dorchester Arts Centre a few years ago. A drum circle is designed to help everyone express themselves freely through rhythm, beginning with warm ups and ice breakers and progressing towards the whole group both making music in the moment and having lots of fun with percussion. Co-founder Glyn Bush is planning a one-off drum circle at Dorchester Yoga Centre and would like to hear from you if you would like to book a place. This event will be for anyone over 14 and will be held on Saturday 22 September at 1:00 – 2:30pm. Drums will be provided but you are welcome to bring your own hand drums or percussion of any sort. No previous drumming experience is necessary. Cost will be kept to a minimum, £5 per person. We are expecting lots of interest in this event so if you would like to attend please email Glyn by the end of July. We welcome back Dr Susan Phoenix with a new workshop “The Energy Within”, and Dominique Preston and Kate Ape with their “Yin Yoga and Sound Workshop”. Sonraya Grace is new to Dorchester Yoga Centre and offers an introduction to her “9 Month Sacred Feminine Programme.” And we are delighted to have Duncan Hulin back in September as we had to cancel him due to the Snow earlier in the year.